A little less risqué than the previous calendars I've had for ops sessions. But, as an actual original from the New England area, it has the additional virtue of being a bona fide time traveler from my era and region. 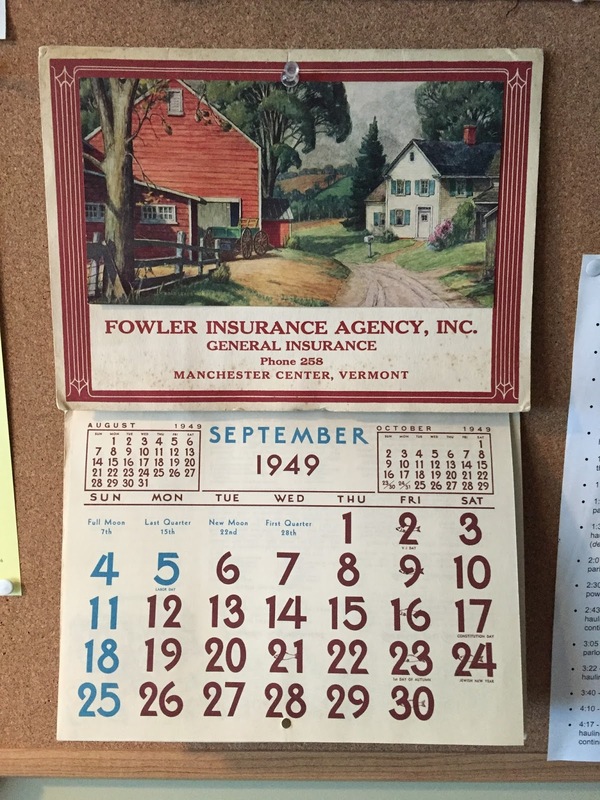 Now I'm, um, "covered" for 1947 and 1949 - but when I do 1948 sessions, I may just have to resort to a pin-up calendar printed off the 'net. Ah well - I'm sure we can struggle through. 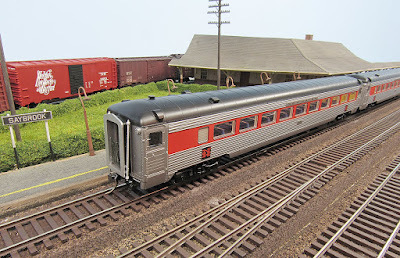 Fantrip with an I-4 and new 8600-series stainless steel coaches heading westbound through Saybrook station on September 22, 1948 . . . Yesterday was September 22nd, but it wasn't Thursday and we weren't in my basement. It was Wednesday, September 22, 1948 and we were operating trains in the Lower Connecticut River Valley. Pursuant to the railroad's Crew Call earlier this week, we had Bill, Bob, Tom, John, and Pieter, as well as greenhorns new guys "Mike" (two MikeRs) running the four locals, and me running the tower and being agent. I even tried to operate a few actual mainline trains, but that's another story. A shot that's familiar to long-time readers, this is typically the first view of session setup - but this time "something new has been added." In addition to the Saybrook Tower control board, fast clock, and the usual paperwork on the desk, this session had a few innovations which I'll introduce below but will be the subject of more-detailed posts in the coming days. Here's the crew sign-in: Not much new here - we have the register itself along with supplies for each crew (apron, uncoupling tool, pencil, and clipboard with a "memo" sheet for noting problems/suggestions). What's new is the iPod/Bose speakers which provide period background music. First "innovation" is actually an adaptation of "job cards" - an idea which I got from Mike Confalone's Allagash railroad. Mike's cards are small, brief descriptions of the work the train does but I added the train's schedule on the front, copied from prototype paperwork, as well as miniature track diagrams of the towns along the route. On the back are "Conductor's Notes" which describe the work to be done, as well as some tips on how to do it. The card on the right is a listing of all the mainline trains that go through Saybrook during a session - 33 of them(!) One of these cards is provided to each of the crews, but only the Shore Line locals (PDX-1 & 2) need to refer to them to know when they have to be clear of the mainline. One of these days, I hope to steal another idea - this time from my friend Trevor - and develop an actual employee timetable for my crews. But this and my Bulletin Order will suffice for now. One of my crew members noted that last session I didn't have any snacks, so this time I made sure O'Rourke's Diner was open and well-stocked in Middletown. True-to-prototype, O'Rourke's is where the crews from the Air Line and Valley locals would "go for beans" while waiting for their tenders to fill. Fortunately enough, my crews tend to get to Middletown about the same time too - and the aisle space here is the widest on the railroad, which allows such a congregation. Additional innovations introduced this session are the laptop running the WiFi throttle server and the foam squares (which I've used before, but not in a long time). Also, this session I finally got around to adding track/siding diagrams on the fascia at the new towns of Saybrook, Essex, Deep River, and East Haddam. In Saybrook this is especially helpful since it shows - albeit in a font which is probably too small - all the switch numbers, which the crews call out to the tower operator so they can be thrown ("normaled" or reversed). Also in Saybrook, I've placed a list of the trains scheduled to come through and their times - critical for knowing when to be out of the way. That same schedule is clipped to a new clipboard in New London/Boston staging so a mainline operator knows what trains need to be run and when. You can see the new board here as well as the mainline trains staged to be run. Yes, with 33 trains to run in both directions, some of these trains will be used more than once. Finally, this session introduced two new structures in Old Saybrook, courtesy BillS. The Saybrook station has been a collaboration for a number of weeks now (and by "collaboration" I mean I did the measuring and materials purchase and Bill did the actual building %^) and I've enjoyed seeing it gradually taking shape, literally and figuratively. It got "planted" last weekend - including scenery - and we (he) even painted the track to get rid of that annoying plastic sheen. What I didn't expect - and which arrived just yesterday - was a fully complete Saybrook Freight House. 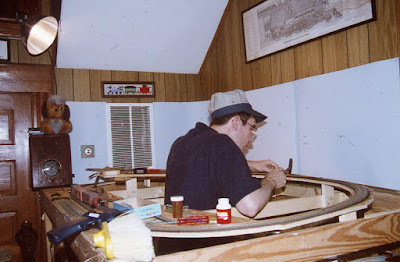 Last I heard, he was "looking forward to doing the freight house now that the station was done" and asked me a couple of questions about window/door placement. But that was last Sunday, IIRC. No progress pics, no other peeps about it. Then, last night, he starts placing peeps people on the station platform and I ooh and ahh all over them - totally missing the fact that he'd taken away the paper mockup of the freight house and replaced it with the actual model(!!) Yeah, I need my eyes checked. As you can see, I eventually saw it. With everything all set up and ready to go, I had the crews sign in and get their paperwork. It gets a little crowded/hectic at this point, with everybody trying to collect what they need to get going, so I'm trying to come up with a better process for starting. Actually, following the prototype even more closely could help. Unlike my sessions, the prototype locals started at different times and though I have a 4:1 fast clock, I wouldn't want folks to be hanging around too long before they can move their train. 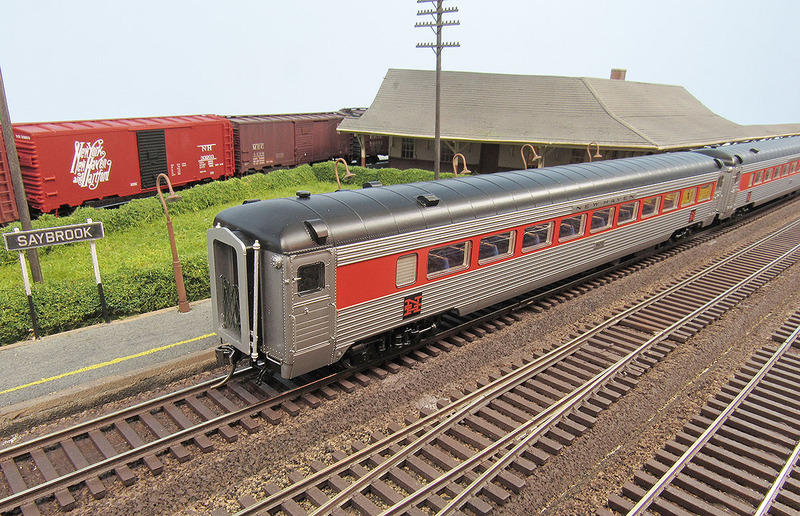 But once underway, everybody is at a different part of the railroad: PDX-1 (Shore Line local) starts in Cedar Hill, as does the Air Line local (HDX-12), though in different parts of the room. 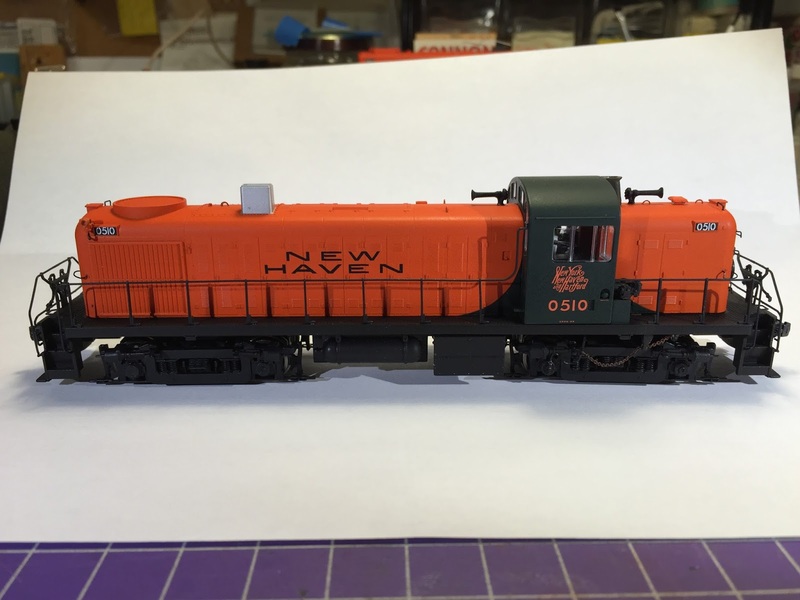 PDX-2 (Haddam local) starts way over in New London, and the Valley Local starts in "Hartford" (nee Middletown). As the session progresses though, the guys - and their trians - do get a little closer. Here's the Air Line local on the left in Middletown & Valley Local on the right in Rocky Hill. Pieter running the loco on the Air Line local in Middletown and MikeR as conductor/brakeman. Mike developed the spreadsheet that I use to generate my car movements. 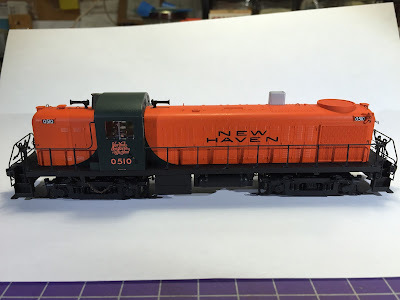 From the "small world" department: I discovered that spreadsheet on the Model Railroad Hobbyist website and have been using it for a number of months now. Mike contacted me a few weeks ago and - much to my surprise - I discovered he lives just up the river from me(!). The "other" MikeR doesn't live nearly as close, having traveled over 90 minutes to attend. But it looks like he's having a good time - probably just happy I finally told him about the F7 brake on the K-1 (he'd been having a devil of a time with the momentum set sooooo high). JohnG's in the background, smiling despite the fact that Rocky Hill doesn't have nearly enough space for all the cars he needs to deliver there. BobV and Bill were crew on the shortest of the locals - PDX-1 only works Saybrook before it terminates, so at most they've got about a real hour's worth of work (4 hrs on the fast clock). One thing we tried this time though was running mainline trains - I figured the PDX-1 crew could do that once their main work was done. 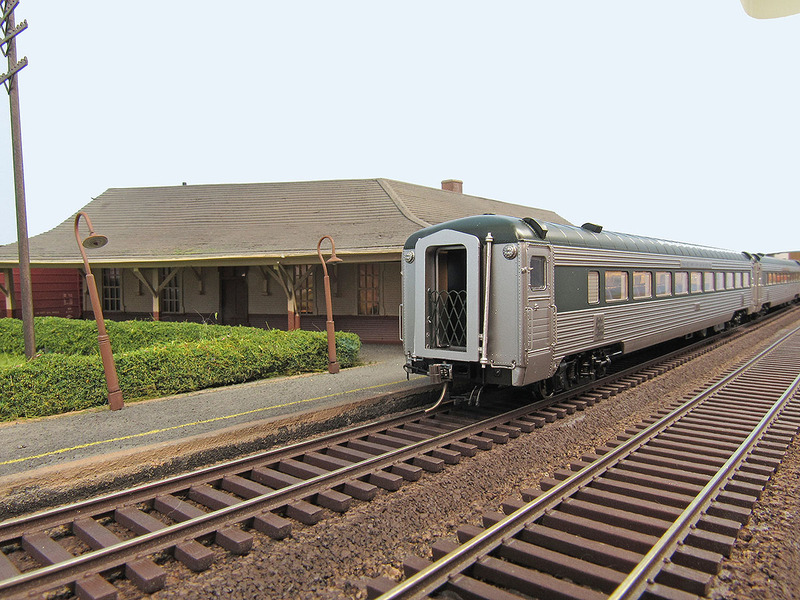 It looks like Bill's enjoying watching the varnish high-step past the beautiful Saybrook station. Mike and John discussing what they would have done differently - BobV weighing in, having finished his run earlier. The Job Cards will need to be fleshed out a bit - at least to make the tip of "leave northbound cars for pickup northbound; don't take them southbound unnecessarily" a little more clear. Last session, PDX-2 had this challenge; this time, it was the Valley Local. And with only a K-1 for power, well, let's just say she was slipping a bit on the way home. WiFi throttle needs to be dialed in better. I'd forgotten to stop the internal wifi on the laptop before starting the JMRI server. Consequently, some of the throttles were running on our main router, which has very spotty coverage in the basement. This led to some minor frustration (remedied by switching to a regular throttle) and one panic moment when a high-ballin' mainline freight went barreling into the yard (and a stub-ended siding) at the same time the WiFi throttle controlling it decided to disconnect (remedied by physically grabbing the locomotive before it T-boned the brand new coaches on the reverse loop)! Need "Engineer's Notes" in addition to the conductor's notes on the job cards. Engineers ought to have a ready reference to what each function key does on their engine. At the very least, the layout host ought to let them know where the brake is! Running mainline trains on schedule is going to be a challenge. It was really cool to see actual trains coming through Saybrook (instead of locals having to pretend a train was coming in order to get out of the way), but with a 4:1 fast clock some of those trains are only an actual minute or two apart. I discovered VERY quickly that I couldn't be the tower operator/agent and try and run the mainline trains (especially not with a wifi throttle!). 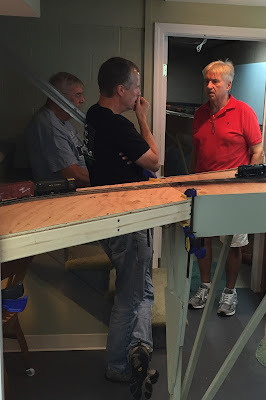 All in all though, the session went very well - any derailments or other major issues were the result of human error (mostly mine) rather than any problem with the trackwork (wiffy throttle being the exception - and which will be addressed). I'm sure during my additional post-session debrief I'll come up with a few more improvements, but for now I'm pretty happy with how things are running. Until next time, all is (finally) quiet in Old Saybrook . 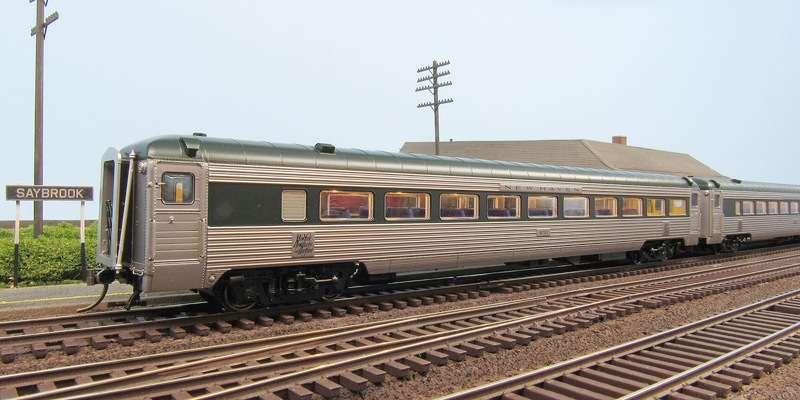 . .
September 22, 1948 is a Wednesday and Harry Truman is the president, currently campaigning for re-election on a whistle-stop tour throughout the western US. The local forecast calls for chilly temperatures in the morning (low 40s), but it'll warm up in the afternoon (around 68 degrees). Should be a nice, sunny, dry day - much nicer than it was 10 years ago. September 21st is the 10 year anniversary of the Great New England Hurricane (a.k.a. The Long Island Express) that devastated our Railroad. But thanks to all your hard work and effort, we survived and even made it through the recent war, stronger than ever. The most popular song of the day is "Twelfth Street Rag" by Pee Wee Hunt and His Orchestra. I much preferred Al Trace's "You Call Everybody Darlin'" that was #1 last month, but even so none of the music today compares to what we heard during the war. Of course, many of those songs bring back bittersweet memories, so maybe we're all just trying to forget. The cost of living keeps going up: The average cost of a new house has risen to $7,700 - reflecting the persistent housing shortage - but gas is still only 16c per gallon, and cars cost a little less - about $1,250, on average. Average wages are stagnant though - at less than $3,000/yr you're not making any more cabbage than you did last year. In sports, the first Olympic games since before the war, ended last month, the same month Ben Hogan won the PGA Championship. The Cleveland Indians and Boston Braves will be in the World Series, but we're all still mourning the passing of Babe Ruth a few weeks ago. Only 53, he was far too young to leave us. Given last month's sports events, you may have missed Whittaker Chambers accusing Alger Hiss of being a communist. But if you're lucky enough to have a television (and as a railroad employee, you probably don't), you would have been able to see the HUAC's first televised congressional hearing and the Chambers/Hiss confrontation. If you'd rather not think of Reds under the bed, and have time to catch a movie this weekend, Sorry, Wrong Number (starring Barbara Stanwyck and Burt Lancaster) premiered on September 1st. If you hurry though, you may still be able to catch Mr. Blandings Builds His Dream House (Cary Grant, Myrna Loy) or even Key Largo (Bogie & Bacall). PDX-1 (The Shoreline Local) will have DEY-1b (HH660) #0924 for power and will depart Cedar Hill for New London with 9 cars. It'll do most of its switching in Saybrook and will use Track 5 to transfer cars destined for up-river consignees to PDX-2 (The Haddam Local). PDX-2 (The Haddam Local) will have DEY-5 (S-2) #0615 for power and will depart New London for Cedar Hill with 13 cars for towns along the way. It will also receive cars from PDX-1 on Track 5 in Saybrook and run up-river through the towns of Essex and Deep River to East Haddam. HDX-7 (The Valley Local) will have K-1b (2-6-0) #278 for power and will depart Hartford for Middletown & return. It'll be a heavy day with 18 cars for consignees along the way. Since it's Wednesday, this train won't be going down-river, but may leave Haddam-bound cars in Middletown for forwarding the next day. HDX-12 (The Air Line Local) will be debuting newly-shopped DERS-2b (RS-2) #0510 for power and will depart Cedar Hill for Middletown with 14 cars for local industries and interchange with HDX-7 in Middletown. This train will also do all the switching in Middletown. Of course, the crews of each of these trains will report to the agent of each town on their route for any additional car movements which may be required - and the Providence Division Extras must receive permission from the Dispatcher or Tower Operator, as the case may be, in order to occupy main track between Cedar Hill Yard and New London. Finally, be sure to review the latest Bulletin Order and sign the Employee Register when you arrive, or else you may forfeit your pay for the day. 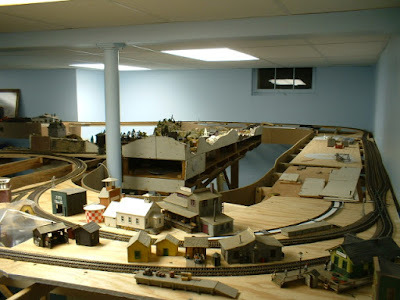 When the Mister and I have new guests to our home and they see all the trains, a question I am often asked is some version of “Do You Mind--?” What they are really asking is, “Do you mind that your entire basement has been taken over by model trains?” “Do you mind that your upstairs bonus room is taken over by model trains (and railroad photographs)?” “Do you mind that your entire house is taken over every Thursday evening - and a few other weekend days a year - by (mostly) men who love model trains and prototype trains?” This is accompanied by either raised eyebrows or a wincing expression akin to that of biting into a juicy lemon. The answer is, in a word, no. I guess my enthusiasm for abandoned rail yards passed muster, because three years later the Mister proposed to me on the Cape Cod dinner train. 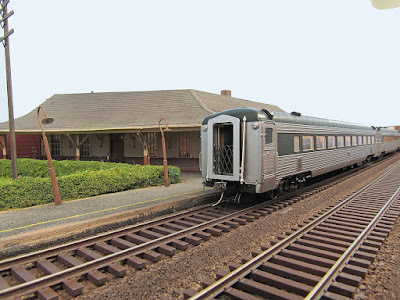 It was a total surprise – I wasn’t suspicious in the least when he asked me to walk back with him to check out the empty, antique dining car. On our honeymoon, we took a train trip down to Savannah and Charleston. 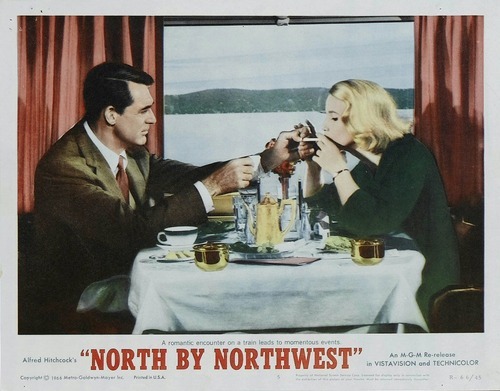 Although Amtrak doesn’t exactly evoke the luxury of train travel in Cary Grant’s North by Northwest, we enjoyed watching the landscape pass by in a way a plane just doesn’t permit. So when we returned home to our apartment, and he asked if I minded a small, 4’ x 6’ layout at the top of the stair landing, why would I say no? And why would I say no when, upon moving into our first house, he wanted to finish the unfinished basement for a train room? I had no plans for it, and as his collection of books and models grew, it was easier to keep them there, all in one place, than divided among the upstairs rooms. 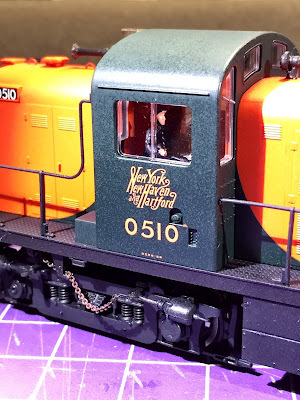 I gladly accompanied him on road trips to photograph factories for the proposed Naugatuck Line, and then the Berkshire Line--which is quite lovely in autumn--when he was researching his first few layout concepts. But, alas, after many, many versions of track plans and Building Benchwork II, we had decided once again that we needed to move. 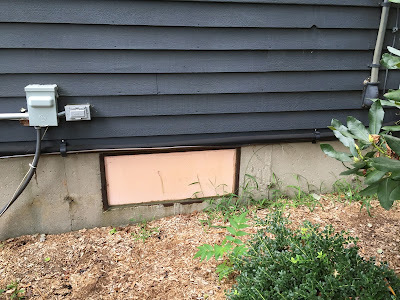 Our former city was too congested, and our neighbor’s new addition seemed to disturb the water table which was causing flooding every time we had a heavy rain. While the Mister worked his late hours in spring, I traveled with our real estate agent to our new dream town, forty miles away, and fell in love with our current house: fireplace, attached two-car garage, big yard, no major renovations needed. I knew that the first thing the Mister would counter-argue was, “it’s too big.” Compared to our tiny 1927 house, this house had so many extra (to us) spaces that upon seeing the bonus room for the first time, I thought to myself, I don’t even know what we would do with all this space! And then I got a Wonderful, Brilliant Idea. The bonus room could be The Train Room. No need to put the books and the models and the photo library in the basement! Two floors up and it could rain all it wanted! 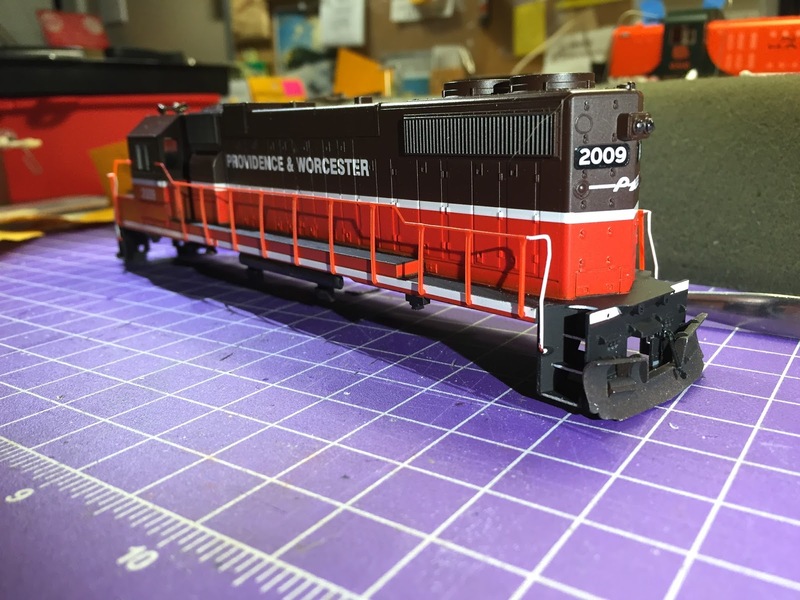 While it still took a tiny bit of convincing, papers were signed and boxes were packed and a really heavy train layout full of Vermont stones (literally) were loaded into the U-Hauls (thanks Tom!) and off we went. The Mister now LOVES his aerie/clubhouse, and sometimes even I and the cats are allowed in. 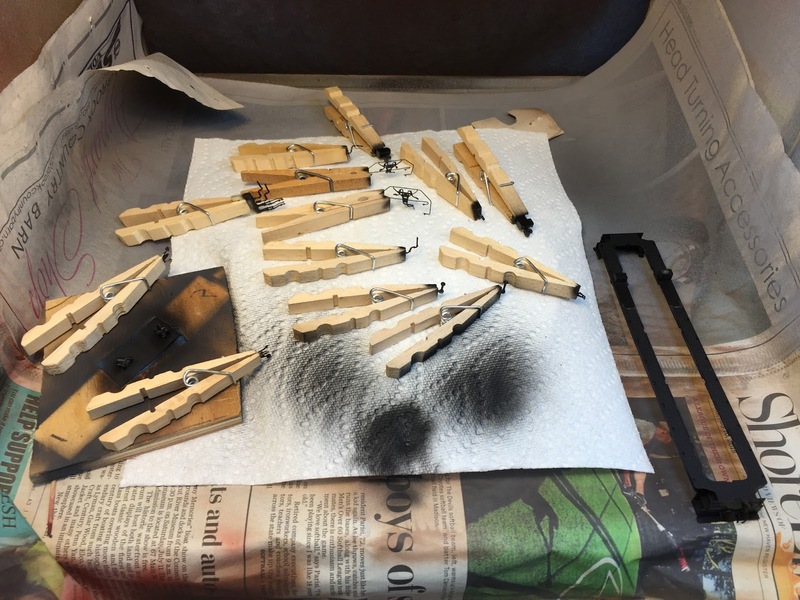 As a train wife, I am thrilled that the Mister has a hobby that engages his mind and fine motor skills, gives him a break from his work, and has allowed him to meet and become friends with so many kind, funny, and generous people. They are like family (we see them more often than our actual families!) and in a world where, despite social media, rates of loneliness are soaring, we feel so blessed to know each of them. What woman wouldn’t want that for her Mister? So, what if your Significant Other has recently shown an interest in trains, or you have met a new man who offers to take you to a deserted rail yard on your third date? What if, before you can pronounce "ferroequinologist" much less spell it, the model railroad magazines begin to take over your coffee table? What if you have no clue who Tom Brady is, but are starting to really get Lionel Strang’s inside jokes? 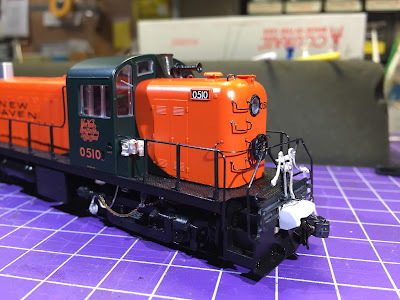 And what if you know you’re at the point of no return when you are grocery shopping and an engine for Shoreline East goes by behind the store, and you think, that’s a GP-40 (true story)! How do you adjust to this new lifestyle? 2. Be Prepared: You never know when, on a visit to a relative’s house or a weekend road trip, you will stumble across abandoned track, bridge abutments, dilapidated factories or mills, or cabooses in the woods that Must.Be.Documented.For.Historical.Record. Bring a book, a podcast, your knitting, or a crossword puzzle, because this could take a while. If it’s time for an Op session, plan a Girls’ Night Out with your friends. Reunion Weekend? Time to do a big house project you can’t get to, or visit family and friends out of state. 3. Per #2, make him drive his own vehicle. 4. 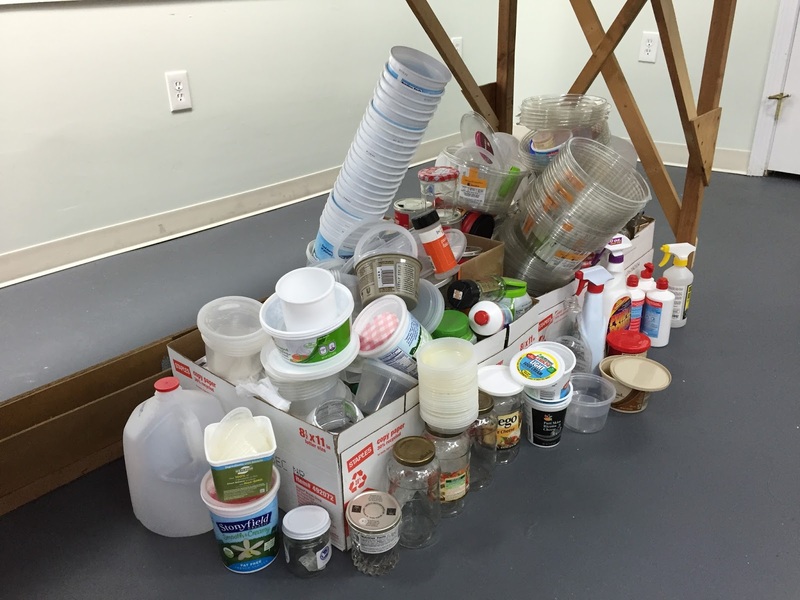 Hide Your Good Tupperware and Kitchen Gadgets. Apparently they are good for mixing Ground Goop and other non-edibles. Above all else, I will leave you with advice from my grandmother, who, when asked, never minded my grandfather’s bowling nights: “It keeps them out of the bars!” Indeed. Not on the Valley Line, but near it - in Hartford, CT. Connecticut Southern freight train northbound past the Legislative Office Building parking garage, heading up the Hartford viaduct through the station. Not sure what those funny rack cars are - never saw them before. As I mentioned yesterday, all ("all") I have left to do on the 0510 is paint the details, weather it, and put it all back together (though I may reverse those last two steps). Painting is one of those things that I always dread, but which (almost) always turns out to be fine in the end. For me, it's mostly about finding a large enough chunk of time to "work my way into it" - not to mention the fact that there's always prep involved. And cleanup. 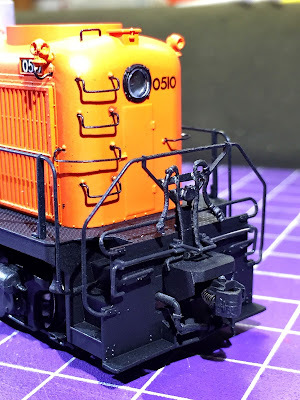 There are a LOT of details on this engine (and on the RS-1 that I plan to do next) that need to be painted before they're applied. And many of those details are TINY. 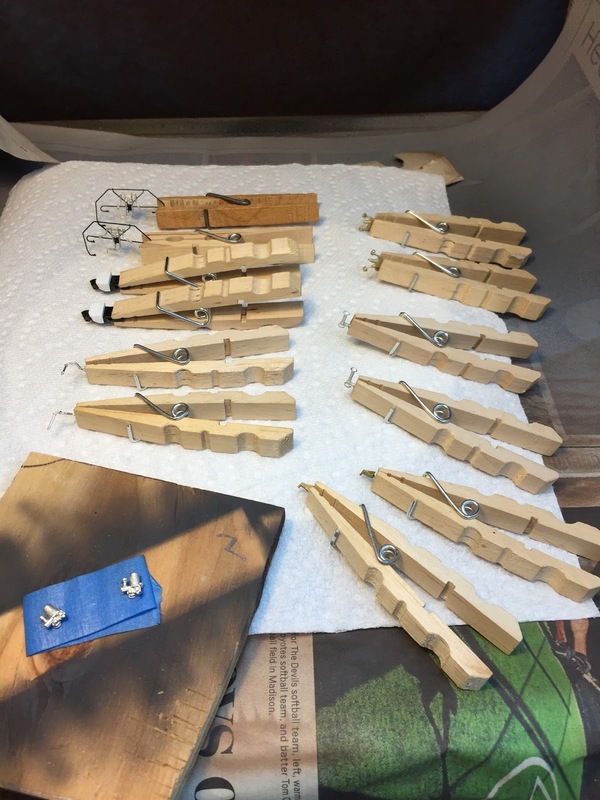 So I used some old clothespins with the jaws reversed to make handy holders. 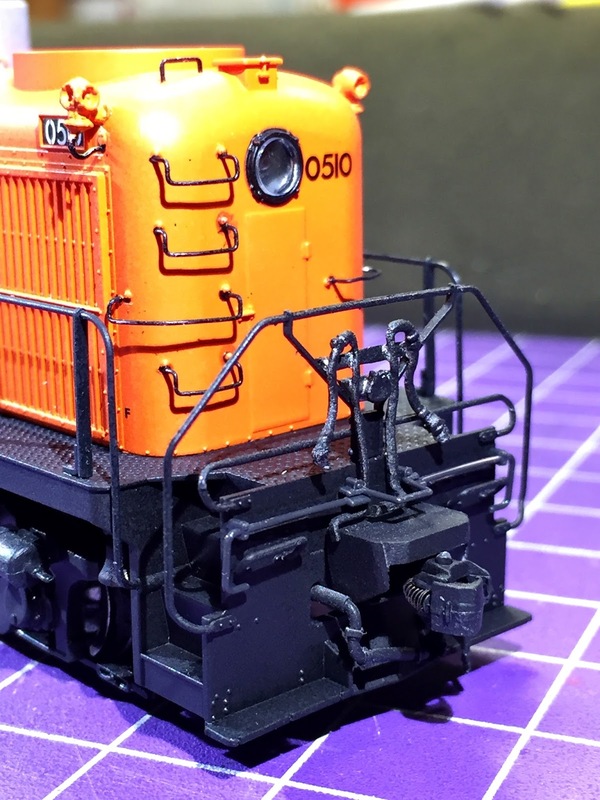 Just pinch the mounting lug that doesn't need to be painted (and probably shouldn't be). I also used tried and true masking tape to hold a couple of details that didn't have anything to hang on to. I also wanted to spray some Dullcote on the truck sideframes, fuel tank, and water tank prior to weathering with chalks and/or PanPastels. The Dullcote not only tones down the glossiness of these parts as they come from the factory, but it'll provide "tooth" for applying the powders. Problem is - I really didn't want to have to remove the truck sideframes since I'd already attached the brake chain guides and speed recorder details. Next time, I'll Dullcote first. I just placed it behind the sideframes and used a pencil to mark where I needed to cut notches to allow it to nest down nicely behind. This not only protects all the mechanical bits (motor, decoder, wires, trucks/gearing) but also keeps too much overspray from getting on the wheels. (though I will clean the wheel treads later with lacquer thinner). Oh - I should also mention my impromptu loco cradle. 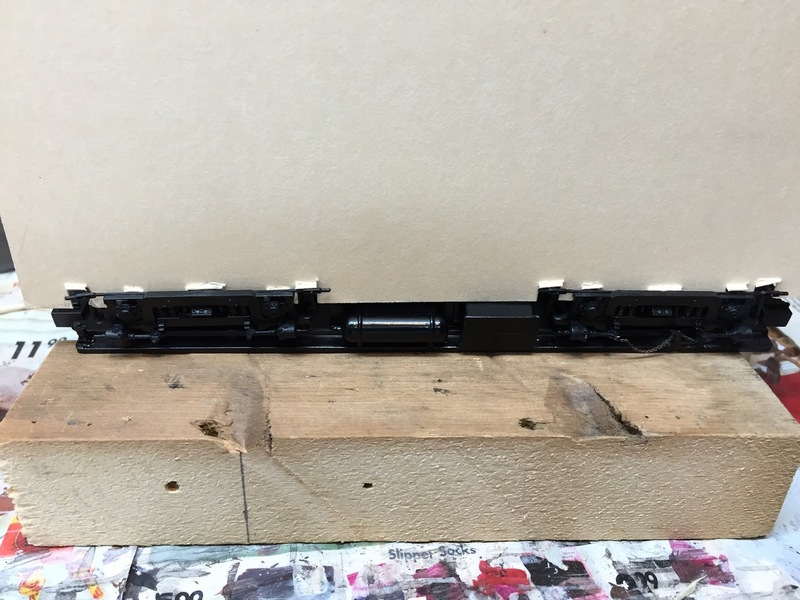 I couldn't insert this mask behind the sideframes from above since the loco frame is in the way. So I had to put the mechanism on its back. But I didn't want to crush any of the delicate decoder wiring (not to mention the decoder), so I just used two scrap pieces of 2x2 and rested the frame/walkways on those as you can see above. Just be careful when you go to grab this get-up: You don't want the two 2x2s to rock in your grip and end up dropping the mech. Ask me how I know. Hope you find these tips helpful - and if you have any tips of your own, let us know in the comments! Well, I think I am finally, just about, done with details for the #0510 - my New Haven RR class DERS-2b (Proto 1000 RS-2). But that doesn't mean that I'm done,done. Not yet. I still need to paint the details, and a few of them need to be glued. And of course I'll need to weather it. 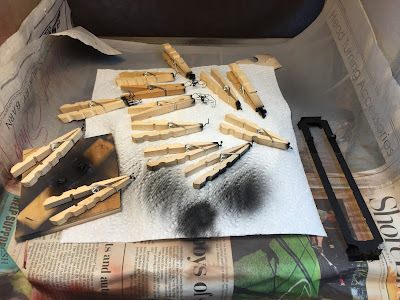 But before I do that, I needed to do a "dry run" to make sure that all the details fit and - most importantly - that they wouldn't interfere with good operation or each other. Best to do that before painting, in case any of them need adjustment. 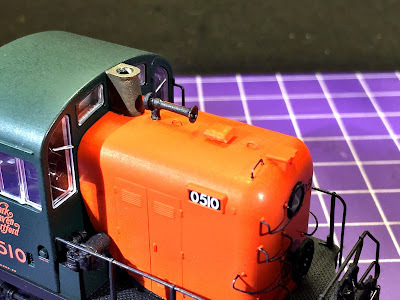 And it turned out that one of the sets of MU pipes needed significant adjustment to clear both the uncoupling lever and the passenger car buffer. The other thing I needed to be sure would fit is the air distributing valve. You'll see it just behind the cab on the fireman's side. I couldn't test fit that accurately until both the cab and the railing were in place. 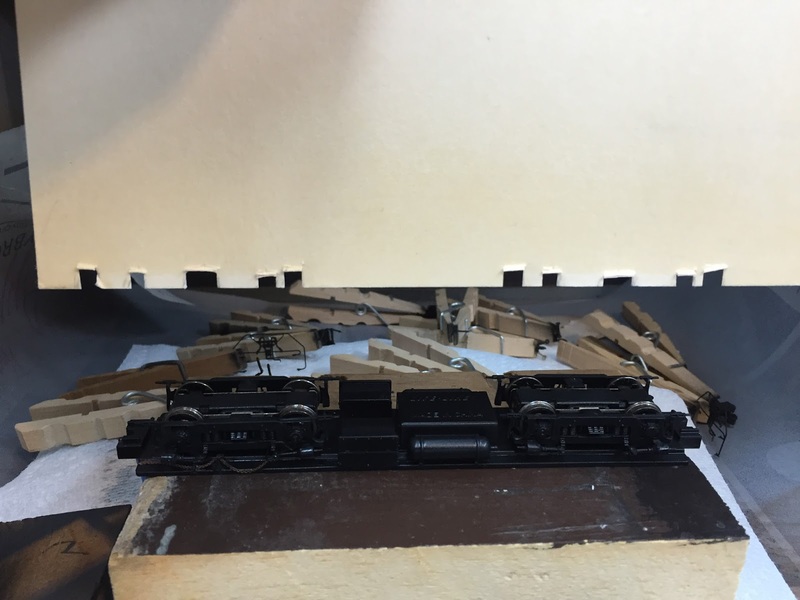 So, here's how it looks for its "dress rehearsal" - everything's in place except for the steam heat pipes/couplings (which have plenty of room). As always, you can click on the image for a larger view. 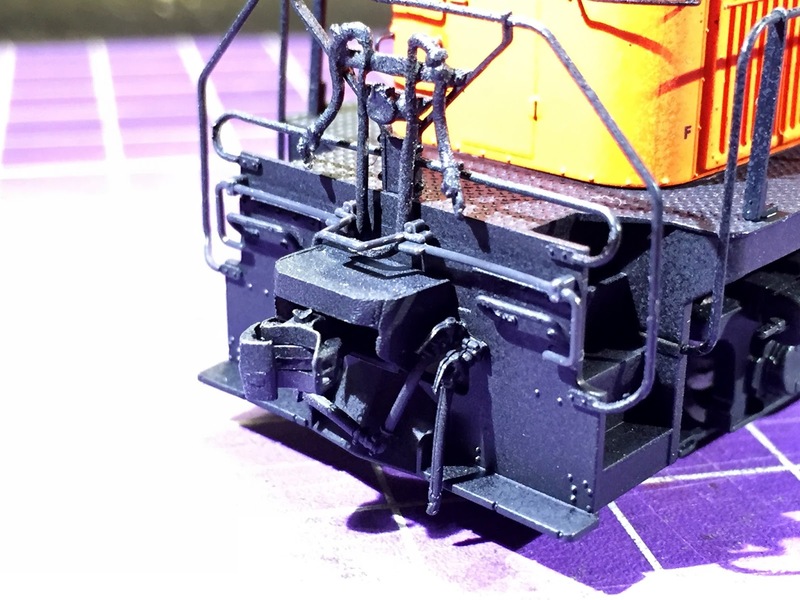 In addition to the hood top details (which you can see much better here and here), you see here the air distributing valve behind the cab, speed recorder, handbrake chain and guides. Front view showing the MU stand and hoses, passenger car buffer, cut lever and end grabs, and air/signal hoses. You've seen the added markers and grabs before. Rear view showing more clearly the speed recorder, air distributing valve, and short hood steam heat details. The pilot details are the same as on the front. I'm really happy with how this project is turning out - especially considering the time it's taken. Suffice it to say, I'm glad I have only one of these P1k units to do. SO many details needed to be added! But it's shaping up and will certainly be worth the effort. 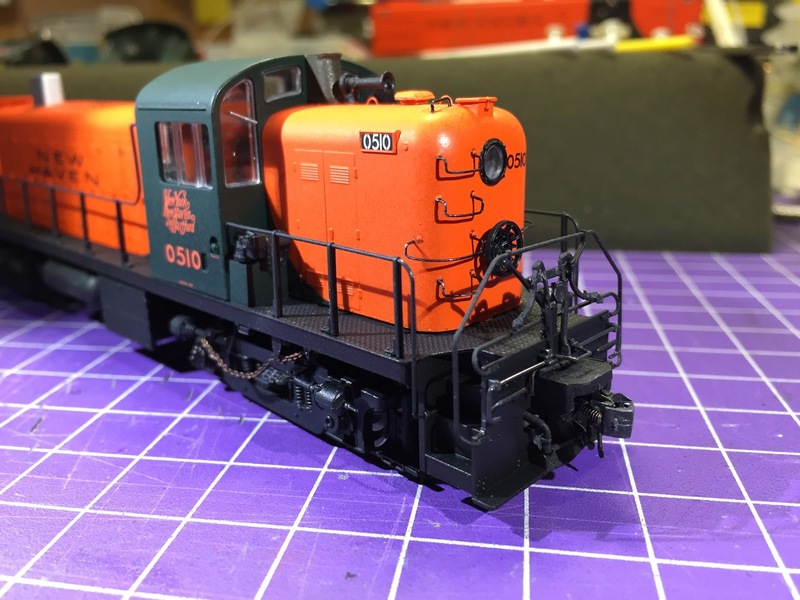 Ever since hearing about using a smart phone to run my layout, I've been intrigued - but as with more things than I'd like to admit, my reach exceeded my grasp. I just couldn't get my head around how to do it. Then I saw Trevor Marshall's excellent article in the August 2015 RMC, and decided to give it a try. I had everything I needed: NCE ProCab DCC system w/serial port, old MacBook laptop, a serial-to-USB adaptor wire, and - most importantly - JMRI, which would get everything to work together. I'd already been able to get DecoderPRO working, albeit very spottily. How hard could it be to achieve the promise of wireless phone throttles? Well, pretty difficult, as it turned out. Before even trying to do the throttle thing, I needed to be sure I had a reliable set-up with JMRI. And I didn't. I just couldn't get everything to communicate reliably. So I set the whole project aside. Now that I'm beginning to have regular operating sessions though, my insufficient number of throttles has become a little frustrating. Thankfully, a number of my regular operators have NCE as well and can bring their throttles, but I hate having to ask them to bring them, even though they're happy to do it. I considered getting "just one more" utility throttle, but at a street price of even $142 (for wireless, which is what I want), suddenly getting wiffy (wi-fi) throttles to work became a priority. Enter my friends Lou and Kaylee. I'd mentioned my plight in passing to Lou at a local NMRA meeting back in the spring and he told me he'd set up wi-fi throttles for a number of folks and could do so for me too. Just in time, he and Kaylee showed up this past weekend to get me all set up. Fortunately, I had a spare wi-fi router (the other critical piece of hardware) and a different laptop to try. Turns out, the MacBook just wouldn't work despite many attempts by experts L&K (of course, it didn't help that I'd long-ago forgotten the admin password, but that's another story). Fortunately, the other laptop in the house, an old PC, worked just fine and after downloading & installing the WiThrottle app it was only a short time later that we were running trains with our phones. 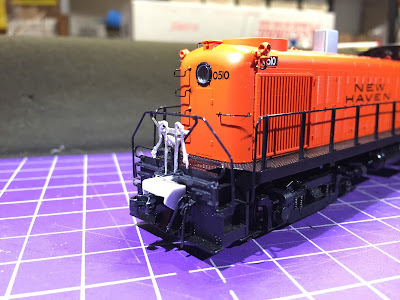 Even more than these resources though, I'll put another plug in to get plugged in to any local model railroaders you can find. In this age of Facebook, YouTube, and other social media, you no longer have to be a "lone wolf" modeler. And there are probably more model railroaders around you than you think. Long-time readers of this blog know that I'm blessed with a number of folks that have helped me along the way - and I've been able to reciprocate as well. That's just the cool nature of our hobby - folks are so willing to help you out. 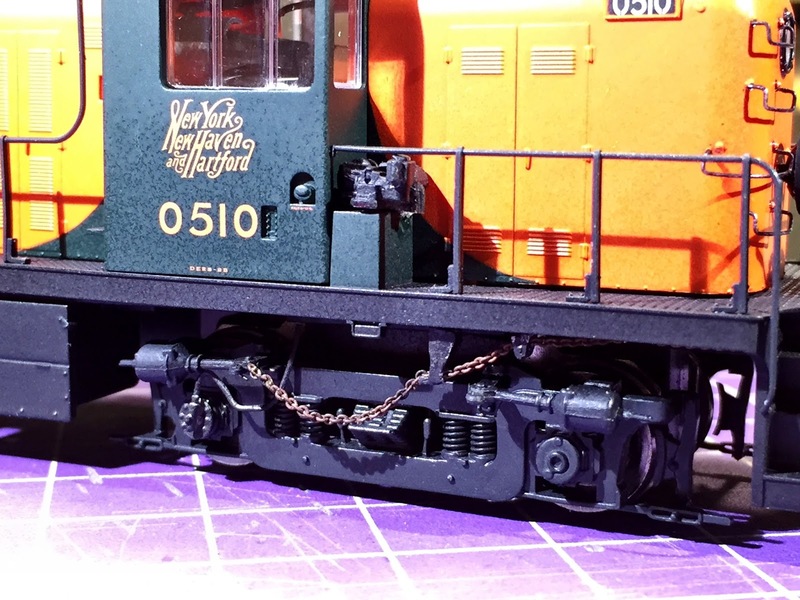 So THANK YOU Lou and Kaylee for spending some time on the Valley Line - thanks to your help, our next operating session should have plenty of throttles to go around. The Missus and I were on vacation last month and, as sometimes happens while on vacation, I took some pictures of some local railroad stuff. I know - shocker, right? Well, as we were literally on our way out and back home, I swung by a particular site to get some detail photos for a friend. He models the area but lives far too far away to get the photos himself. I was literally in the neighborhood so wanted to help out so I hopped out of the car with my iPhone, took a bunch of photos, got back in the car and drove home. That was almost a month ago. Yesterday I (actually, the Missus since it was her car) got a phone call from a detective asking what we were doing that day. Apparently, somebody saw something and said something and the local detective was following up. He'd already found out a bunch about us, well, me, since I leave quite a digital footprint with this blog, my website, and youtube. Fortunately, what all he found out corroborated my explanation that I was just taking photos for model railroading purposes. My usual practice is to check with somebody first before taking photos, to avoid any confusion or suspicion. And the real irony here is that I actually know the owner of the place where I was taking photos. But I was in a hurry and it was only a few photos. And it's a big place, so apparently one of the employees - who of course doesn't know me from Adam - was concerned. So, if at all possible, when you're taking photos see if there's somebody in the area you can tell: a property owner, or somebody nearby that might otherwise be suspicious. In this day and age, I guess we all have to be a little extra careful. And that's your PSA for today. The four primary trains on my layout (and the only trains I'm currently running) are four local freights which technically have no schedule. Sure, according to certain railroad documents there's some sort of rough schedule (time on duty, approximate time of arrival at each location), and the locals should try and get to certain places by a certain time (if only to pick up or set out hot cars or make a connection with another train), but the only real time they have to worry about is the "16 hour rule" when they have to take themselves out of service (or "outlaw"). Despite this, I use a fast clock during my operating sessions ("there's an app for that") since I really like the feeling of the "day" going by. I haven't (yet) gotten sophisticated enough to simulate the passage of the sun across the sky (though I do hope someday to have nighttime ops, and structures with interior lighting), but you'd be surprised at how effective a fast clock is in giving you a similar feeling. It also gives you the "times" you can record on Train Orders, Switchlists and other paperwork and keeping track of such things increases the level of realism. The local from Cedar Hill yard to New London (PDX-1) took "3hrs 15mins" and spent over "2 hours" switching Old Saybrook and exchanging cars with its counterpart (PDX-2). In actual, real time it took less than an hour. The local that goes from New London, exchanges cars with PDX-1 in Old Saybrook, goes up the Valley branch, and continues on to Cedar Hill yard took over "10 1/2 hours" to do its work (2hrs 45mins real time). Finally, our namesake and persistently outlawing Valley Local took almost "12 hours" to get from Hartford down to East Haddam and back, working all the towns en route and doing a lot of switching in Middletown. In real time, it took 3 hours, but thanks to the 4:1 clock the "fast time" is actually pretty close to the prototype amount of time this job took back in 1947. It didn't outlaw, but it was - and continues to be - the train that takes the longest amount of time. 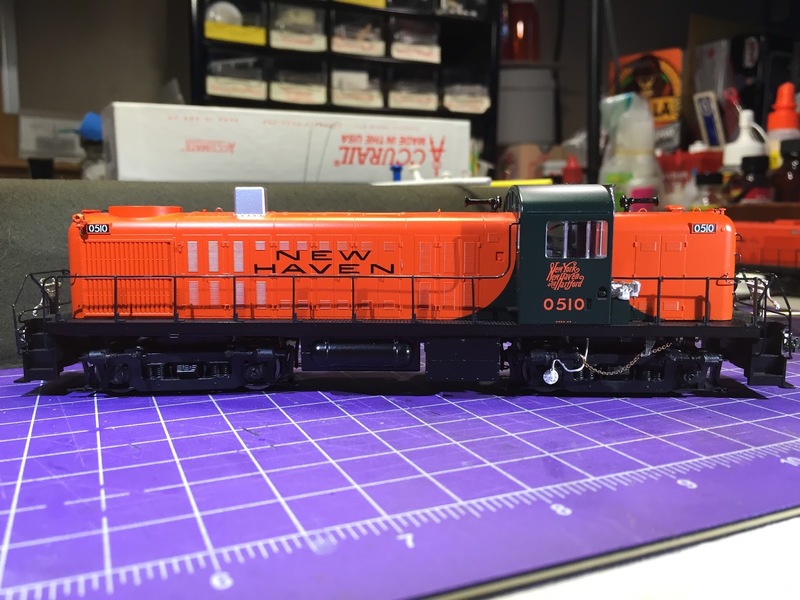 One of the primary reasons I decided to expand my layout beyond just "The Valley Local" (with cameo appearance by the Airline Local) was to include the other two local freights in the lower CT river valley and, consequently, to double the number of folks I could host for an operating session. It only took a few ops sessions on the original layout to discover that "more would make even merrier." So now, instead of just 4 guys (two crews) in addition to me acting as layout host and A-O, I can have 8 guys over (for a total of 10, including me and an assistant superintendent - usually Randy). But I'm discovering that keeping all those guys busy for the whole session is a challenge, despite having 4 trains now. As you can see above, the Shoreline and Airline locals don't have near the amount of work as the two locals serving the Valley Line (north and south ends). This isn't too surprising since the amount of work is directly related to the amount of real estate/layout involved: HDX-12 has only Somerset and Mill Hollow to worry about (depending on how much we require it to do in Middletown) and PDX-1 really has only Old Saybrook to deal with. While not prototypically correct, I could have the Airline local do all the switching in Middletown. That would actually address two needs: increasing its work/time, and reducing the work/time of the Valley local. 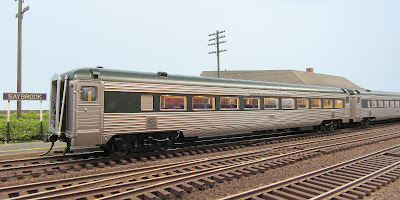 I could have one crew work both the Shoreline local (PDX-1) and the Airline local. For example, given the timing, the Shoreline local's work could be done while the Airline local is waiting in Middletown (thought that waiting isn't very prototypical either). A variation on the above: One crew works both locals, but sequentially rather than while one is waiting. Have the Airline local get in/out of Middletown prototypically (without waiting for HDX-7) and then operate PDX-1. Or the other way around, whichever sequence makes sense. While the last option is most prototypical, the first option retains the maximum number of crew members. 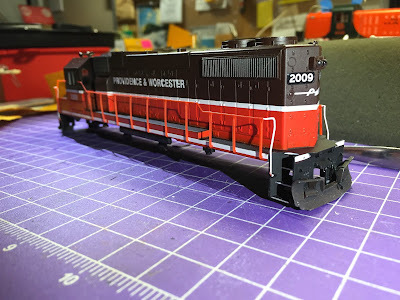 But like everything else on a model railroad, there are inevitable compromises with the prototype - some sessions I may just choose to follow the prototype a little less than fully. And that's ok.